The US may have plans to use a fake chemical attack in Syria to hit government forces with airstrikes, the Russian Defense Ministry has said. Washington is already building up strike capability in the Middle East, it said. The warning comes a day after the Russian military said it had information about a looming provocation in Syria’s Idlib governorate, which would involve a staged chemical weapons attack. The US earlier warned it would respond to a chemical weapons attack by Syrian government forces with retaliatory strikes, which would be stronger than those conducted by the US, the UK and France in April. 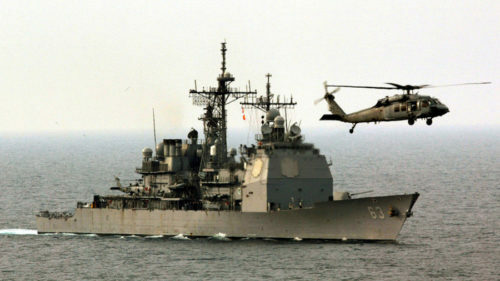 In a statement published on Monday, the Russian MoD said it noted the deployment to the Mediterranean last weekend of the missile destroyer USS Ross carrying 28 Tomahawk cruise missiles on board. It came after a similar move of the USS The Sullivans to the Persian Gulf and the rebasing of a B-1B Lancer strategic bomber to an air base in Qatar. The Russian ministry said the “preparations are the latest evidence of the US intention to use the” expected provocation. The statement reiterated that the Hay’at Tahrir al-Sham militant group, previously known as Al-Nusra Front, was preparing a staged chlorine attack in a city in Idlib. It alleged that a group of jihadists, trained in the handling of chemical weapons by the British private military contractor Olive Group, has already arrived in Jisr al-Shughur. The group will “stage decontamination of victims of a staged chemical weapons attack posing as members of the notorious White Helmets group,” the ministry claimed. “The implementation of this provocation, which is being conducted with the assistance of the British intelligence services, is meant to serve as the latest pretext for the US, Britain and France to deliver a missile strike against state and economic facilities in Syria,” said General Igor Konashenkov, spokesman for the Russian Defense Ministry. In April, a reported chlorine attack in Syria’s Eastern Ghouta neighborhood served as justification for the US, UK, and France to attack what they claimed to be sites involved in a clandestine Syrian chemical weapons program. The missile attacks came just as a team of international inspectors was set to arrive at the scene to collect evidence of the supposed attack. 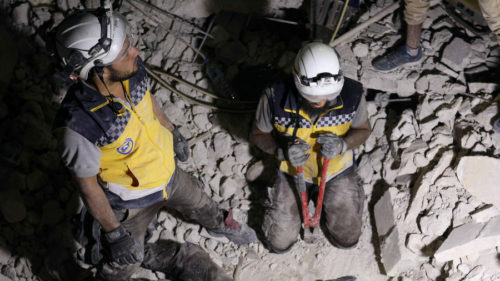 Later, residents of the area told journalists that the footage of the treatment of the alleged victims of the attack was filmed by the White Helmets group after they orchestrated a panic at a local hospital. The patients there were not poisoned by chlorine, local medics said. The footage was presented by the mainstream media as proof that an attack took place. This article was posted on Monday, August 27th, 2018 at 2:47pm and is filed under "The West", Chemical weapons, Disinformation, Media, Mercenaries, Militarism, President Bashar al-Assad, Proxy Armies, Syria, United States, US Hypocrisy, US Lies, US Terrorism, Violence, War Industry.